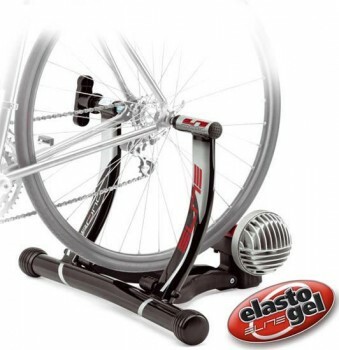 This is one of Elites more popular turbo trainers. It is simple, stylish, stable and smooth. It comes preassembled and folds together for easy storage. Compared with other home trainer machines, its stability is excellent and it is vibration-free and extremely quiet while working. The faster you ride, the tougher its fluid resistance system gets, there is no means to control the resistance manually. The power curve is progressive and not as steep when compared to other cycle trainers of its kind thus making it much suited to both new and intermediate riders alike. Since you don’t have to plug it in before you ride or worry about any resistance adjustment, you have the freedom to train anywhere you like around your home whether inside or out.